Dr. John Simon graduated from Michigan State University School of Veterinary Medicine in 1967. He practiced only conventional medicine for 13 years before he became intrigued with acupuncture and became Detroit’s first certified veterinary acupuncturist. Ten years later he became the first Detroit practitioner to receive a diploma from the American Veterinary Chiropractic Association (AVCA). He continues to practice conventional medicine but integrates it with the many holistic modalities that he has studied, including inaddition to acupuncture and chiropractic, herbal medicine, systemic enzyme therapy, megavitamin therapy, glandular therapy, ozone therapy, prolotherapy, pulsed magnetic and Bemer therapy (PEMF), Laser therapy, cryosurgery, and Frequency Specific Micro-current Therapy (FSM). He was the first veterinarian in Detroit to perform “in house adult stem cell therapy on animals. Dr. Simon became the owner of the Woodside Animal Clinic in 1970 where for 50 years he was the solo practitoner treating dogs, cats, birds, rabbits and rodents. He has recently taken on a colleague so he can have more time to follow some of his non medical interests. His work at “Franklin Holistic Medical” will be limited to only a half day a week when he will give 2nd opinion holistic consults and make recommendations for holistic therapies that can be performed at the Woodside Animal Clinic. 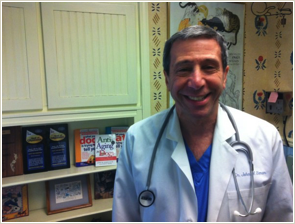 Dr. Simon is a past president of the Oakland County Veterinary Medical association and has served on the board of the American Holistic Veterinary Medical Association (AHVMA). He has written 3 books on pet health care and is the creator of “People, Pets, and Vets”, a program put on each year by the Michigan Veterinary Medical Association.